Installing Computers During the Northwest Library Construction is a picture, with genre photograph and group portraits. Its dimensions are 4 in. x 6 in.. It was created in 1996. Worthington Libraries is the Contributor. 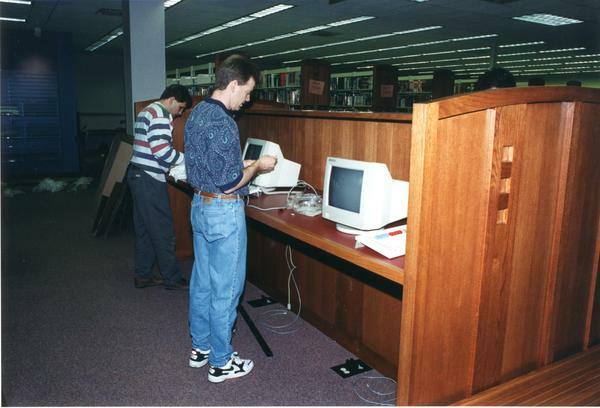 Workers are shown here installing computers during the Northwest Library construction. Groundbreaking for the library construction took place on September 13, 1994, and the library opened its doors to the public on April 16, 1996. The Northwest Library was the first library in Ohio and only the second in the country to be built and operated by two library systems, which were the Worthington Libraries and the Columbus Metropolitan Library. It covers the topics computers, libraries and construction. It features the organizations Columbus Metropolitan Library, Northwest Library, Old Worthington Library and Old Worthington Library. The Worthington Libraries identification code is wpl0162. This metadata record was human prepared by Worthington Libraries on March 28, 2016. It was last updated September 28, 2017. This month, Northwest Library is 20 years-old! Step inside our April exhibit to look back on two decades of library services.